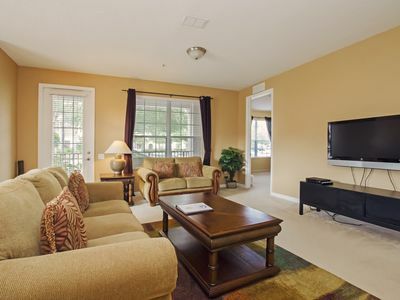 This 4 bedroom 2 bath condominium is located in Orlando’s newest resort community of Vista Cay at Harbor Square. 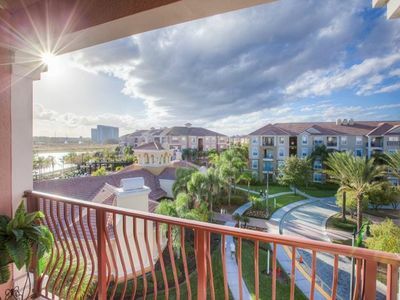 Tuscan themed Vista Cay offers spacious accommodations that are ideal for either the family wanting to be close to all the excitement of International Drive, couples getting away for a short break, as well as the discerning business traveler in town for a meeting or a big convention. 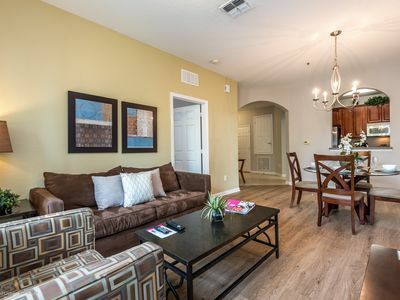 This beautiful 2,097 square foot open plan home with tasteful interior design boasts a master bedroom featuring one king-sized bed, the second bedroom has a full-sized bed, and the third themed bedroom has 2 twin beds. 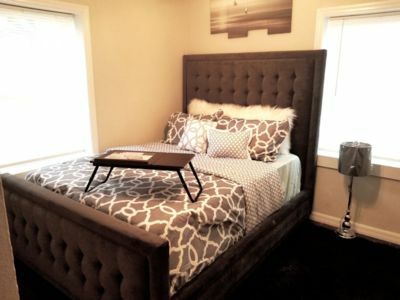 The study has been converted into a fourth bedroom, which has a king-sized bed. 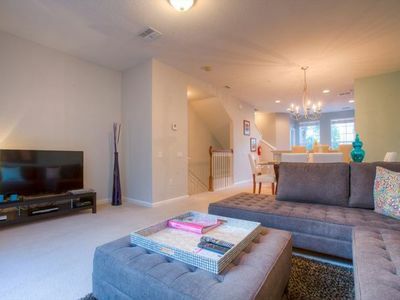 This impressive home sleeps a total of 8 guests. 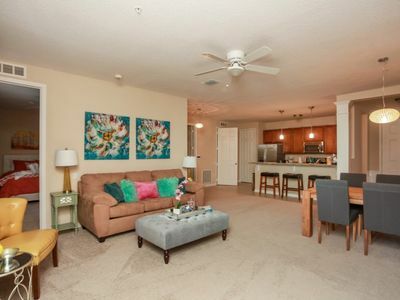 This layout has a spacious owner's suite and a covered lanai. 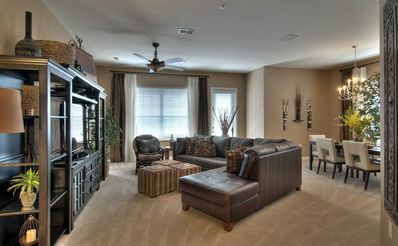 The comfortable living area has a leather suite, 42' wide screen TV, wireless internet access and cable TV. 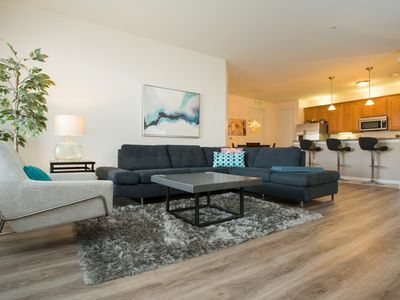 This is where you sit back, relax and think to yourself ‘why have I stayed in a hotel room, when this condominium offering a generous layout, gorgeous furnishings and all it’s comforts of home is available’? 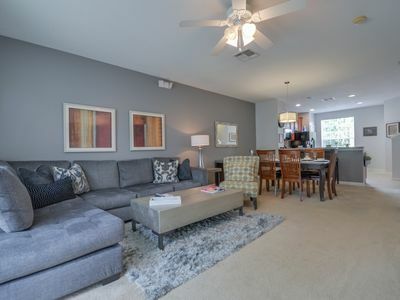 Entertaining, cooking and being able to share private time together with friends and family is fun and enjoyable. There is no need to miss out on any of the conversation, when using the ‘open plan’ fully equipped kitchen and dining area! 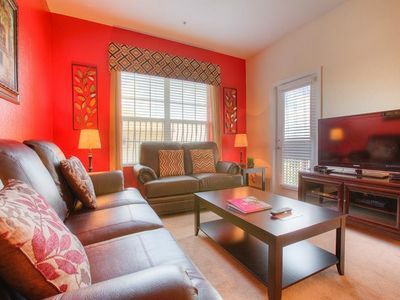 Unit amenities include; towels, linen, coffee maker, iron, ironing board, hair dryer, microwave oven, refrigerator, electric stove, dishwasher, electric toaster, central air/heat, dishes, cookware and utensils. Also available are washing and drying facilities, making it easier to have those ‘little one’s’ ready in time. Why pack a big suitcase when you can wash their favorite sports jersey or best-loved dress! 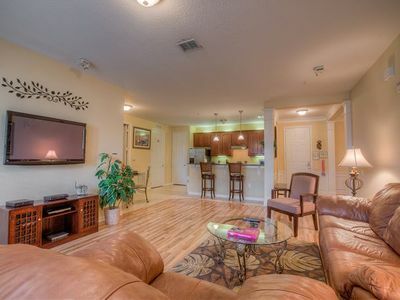 Also, free local calls are a feature offered in this property. 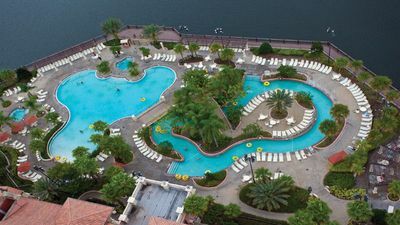 For your pleasure and enjoyment, the resort amenities include; a clubhouse, tropical lagoon pool and spa, children’s pool, sports court, fitness center, games room, movie theater, internet library, meeting space, elevators and a concierge service and gated entrances. 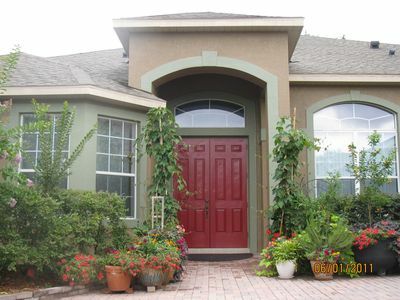 A beautifully landscaped walking trail and a number of golf courses are nearby! 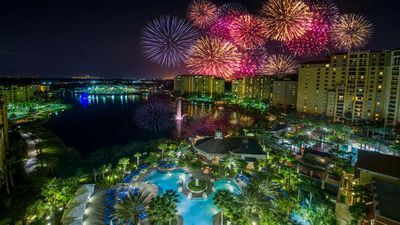 Restaurants, shopping, water parks and Orlando nightlife are just around the corner. 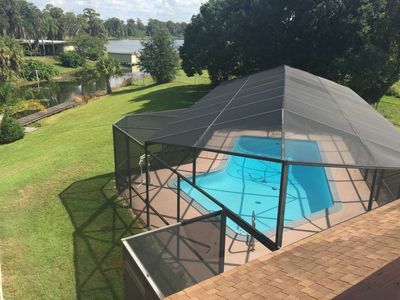 The community of Vista Cay is located on the beautiful Lake Cay, situated right next to the Orange County Convention Center and only a short distance from Walt Disney World, Universal Studios and SeaWorld Adventure Park and even closer to SeaWorld’s newest park Aquatica. 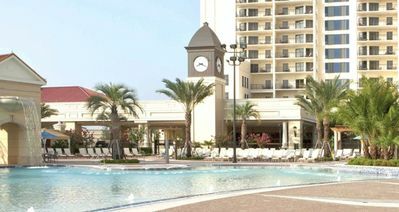 Vista Cay at Harbor Square is located in Orlando's newest development, Universal Boulevard and is at the center of some of Orlando's greatest experiences. 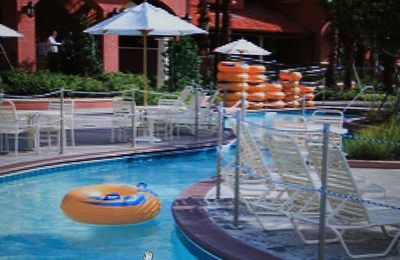 Not forgetting, that this wonderful resort is only a short drive from Orlando International Airport. 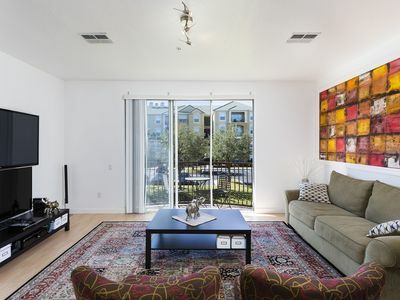 A quiet, private ground floor unit with lots of space and natural light. Luxury Vacation Home. Perfect for Family Vacation. NEW! 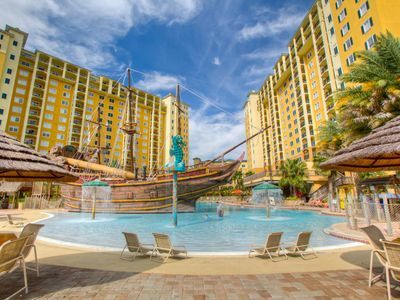 Orlando Apt w/Pool Access - Near Theme Parks! 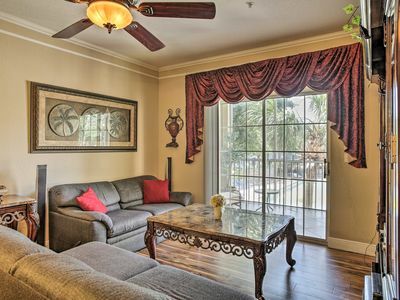 Bright + Spacious Deluxe Suite | Theme Park Shuttles! Bonnet Creek Bargains @ Disney's Door - Book with confidence!